• Folks are still curious about the 30-plus-year-old highway project to connect U.S. 411 to I-75. Ethan Ellis (left) and Chuck Ellis review Georgia Department of Transportation route maps for the Rome-Cartersville Development Corridor during a public meeting in Cartersville on Tuesday. The proposed alignment for the Rome-Cartersville Development Corridor is in blue on this Georgia Department of Transportation map. Atlanta developers Patrick Bellefleur (left) and Christian Witter fill out GDOT comment cards Tuesday at the public meeting to review the latest route for the Rome-Cartersville Development Corridor. The route would go right through where the developers were hoping to start a subdivision. Residents of Rome and Cartersville got a chance to review the latest plans for the Rome-Cartersville Development Corridor in Cartersville Tuesday evening. DOT officials brought maps and personnel to explain what people were looking at in order to accept additional public comment on the project. A huge crowd turned out at Faith United Methodist Church for the informational session. Atlanta real estate developers Patrick Bellefleur and Christian Witter said the new route would go right through where they were planning to building a subdivision. Long referred to as the Highway 411 Connector, the route has been the subject of controversy for more than 30 years. It's history could almost fill a section of the encyclopedia. In January of 1993, U.S. District Court Judge Robert L. Vining Jr. issued an injunction against the use of federal funds citing irreparable injury to the Rollins family who would have had a large ranch bisected by the route, along with GDOT's failure to properly study alternatives. The project was resurrected more than a decade later but ran into further issues in the form of the Dobbins Mine landscape in 2009. The old manganese mine was deemed eligible for listing on the National Register of Historic Places. The National Environmental Policy Act prohibits the use of certain historical properties for road proj ects unless there is no feasible alternative. The latest iteration of the direct link to I-75 would extend from the U.S. 411/U.S. 41 interchange on the west side of Cartersville to I-75 just north of the Budweiser brewery, sliding past two major industrial sites, the Trinity Rail and Gerdau Ameristeel plants, on close alignment with the Old Grassdale Road. "I'm still trying to get a grasp on all of this right now," said Chuck Ellis, Cartersville. "There are still a lot of unknowns." Cary McCoy, Cartersville, said the latest route goes north of his property whereas the previous route would have taken it south of his home. The route now under consideration got additional leverage about two years ago when Anheuser Busch Inc., the Belgian company which owns the brewery, decided it would make property it owned north of the brewery available for economic development purposes. An intersection at that location would also allow Bartow County to extend the route across the beer maker's 1,200-plus-acre property to the Highland 75 Industrial Park managed by the Cartersville-Bartow Joint Development Authority and essentially create a mega-industrial site. Ed Culican, with Mott- MacDonald, a consulting firm that has been working on the project for GDOT, said roundabouts were added at five key intersections along the route following seven months of traffic analysis last year. A sixth roundabout would be added where the Old Grassdale Road realigns to flow directly into the Highland 75 Industrial Park. Roger Imsande, Cartersville, said he was pleased to see all of the roundabouts. "They make good sense," Imsande said. GDOT officials and Bar tow County leaders also believe that the new route would relieve some conges tion along U.S. 41 coming straight through Cartersville. GDOT Communications Officer Mohamed Arafa said the timetable has right-ofway acquisition beginning in 2022, bidding in 2027 and the project hopefully being completed by 2030. 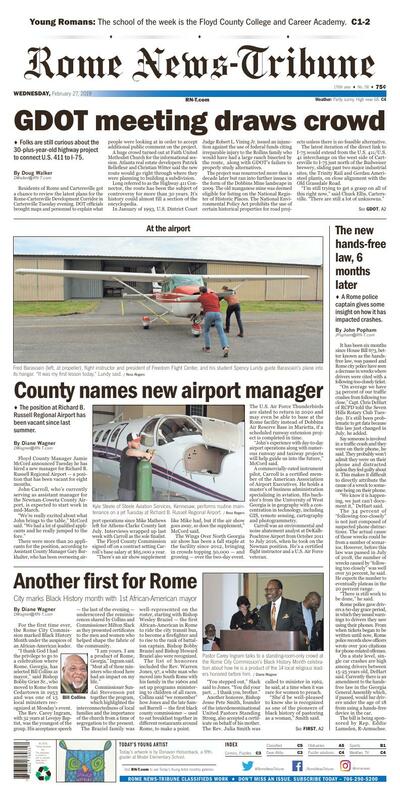 • The position at Richard B. Russell Regional Airport has been vacant since last summer. Fred Barasoain (left, at propeller), flight instructor and president of Freedom Flight Center, and his student Spency Lundy guide Barasoain's plane into its hangar. "It was my first lesson today," Lundy said. Kyle Steele of Steele Aviation Services, Kennesaw, performs routine maintenance on a jet Tuesday at Richard B. Russell Regional Airport. Floyd County Manager Jamie McCord announced Tuesday he has hired a new manager for Richard B. Russell Regional Airport — a position that has been vacant for eight months. John Carroll, who's currently serving as assistant manager for the Newnan-Coweta County Airport, is expected to start work in mid-March. "We're really excited about what John brings to the table," McCord said. "We had a lot of qualified applicants and he really jumped to the fore." There were more than 20 applicants for the position, according to Assistant County Manager Gary Burkhalter, who has been overseeing airport operations since Mike Mathews left for Athens-Clarke County last July. Interviews wrapped up last week with Carroll as the sole finalist. The Floyd County Commission signed off on a contract setting Carroll's base salary at $65,000 a year. "There's an air show supplement like Mike had, but if the air show goes away, so does the supplement," McCord said. The Wings Over North Georgia air show has been a fall staple at the facility since 2012, bringing in crowds topping 50,000 — and growing — over the two-day event. The U.S. Air Force Thunderbirds are slated to return in 2020 and may even be able to base at the Rome facility instead of Dobbins Air Reserve Base in Marietta, if a scheduled runway extension project is completed in time. "John's experience with day-to-day airport operations along with numerous runway and taxiway projects will help guide us into the future," McCord said. A commercially-rated instrument pilot, Carroll is a certified member of the American Association of Airport Executives. He holds a master's of business administration specializing in aviation. His bachelor's from the University of West Georgia is in geography with a concentration in technology, including GIS, remote sensing, cartography and photogrammetry. Carroll was an environmental and noise abatement analyst at DeKalb-Peachtree Airport from October 2011 to July 2016, when he took on the Newnan position. He's a certified flight instructor and a U.S. Air Force veteran. Pastor Carey Ingram talks to a standing-room-only crowd at the Rome City Commission's Black History Month celebration about how he is a product of the 14 local religious leaders honored before him. Commissioner Sundai Stevenson said, "I want all of us to remember we're in this together ... We're all in this together." For the first time ever, the Rome City Commission marked Black History Month under the auspices of an African-American leader. "I thank God I had the privilege to go to a celebration where Rome, Georgia, has selected Bill Collins as mayor," said Bishop Bobby Grier Sr., who moved to Rome from Cedartown in 1953 and was one of 15 local ministers recognized at Monday's event. The Rev. Carey Ingram, with 32 years at Lovejoy Baptist, was the youngest of the group. His acceptance speech — the last of the evening — underscored the reminiscences shared by Collins and Commissioner Milton Slack as they presented certificates to the men and women who helped shape the fabric of the community. "I am yours. I am a product of Rome, Georgia," Ingram said. "Most all of these ministers who stood here had an impact on my life." Commissioner Sundai Stevenson put together the program, which highlighted the interconnectedness of local families and the importance of the church from a time of segregation to the present. The Braziel family was well-represented on the roster, starting with Bishop Wesley Braziel — the first African-American in Rome to ride the city transit bus, to become a firefighter and to rise to the rank of battalion captain. Bishop Bobby Braziel and Bishop Howard Braziel also were recognized. The list of honorees included the Rev. Warren Jones, 97, a white man who moved into South Rome with his family in the 1960s and set up programs ministering to children of all races. Collins said "we remember" how Jones and the late Samuel Burrell — the first black county commissioner — used to eat breakfast together in different restaurants around Rome, to make a point. "You stepped out," Slack said to Jones. "You did your part. ... I thank you, brother." Another honoree, Bishop Jesse Pete Smith, founder of the interdenominational United Pastors Standing Strong, also accepted a certificate on behalf of his mother. The Rev. Julia Smith was called to minister in 1962, he said, at a time when it was rare for women to preach. "She'd be well-pleased to know she is recognized as one of the pioneers of black history of pastoring as a woman," Smith said. The Rev. Louise McCluskey, with more than 40 years in service, was on hand to accept her certificate. She noted that her Glorious New Jerusalem Pentecostal Church was integrated early, and her ministry extended beyond the church. "I did prison ministry; I did jail ministry; I did street ministry. And some of those people are now ministers," she said. "It's great what God can do, and it's not over yet." Others honored included the Rev. Terrell Shields, who founded the annual Thanksgiving Love Feast, and Bishop Nealon Guthrie, who turned a house of ill repute called Peggy's Place into Greater Christ Temple Rapture Preparation Cathedral. Bishop Norris Allen, an entrepreneur who encouraged Collins in his own business and community involvement; the Rev. James B. Jewell of Pleasant Grove Baptist Church; the Rev. Gordon Wells of New Life of St. John the Baptist Church; and Bishop Alex Allen of Faith Temple on Bran ham Avenue also were acknowledged as longtime pillars. "We as black folk have come a long way," Bishop Alex Allen said. "And we want to continue." Attendees agreed, and applauded when Stevenson emphasized the sense of community embodied in the city's network of churches. "I want all of us to remember we're in this together ... We're all in this together," Stevenson said. • A Rome police captain gives some insight on how it has impacted crashes. It has been six months since House Bill 673, better known as the hands-free law, was passed and Rome city police have seen a decrease in wrecks where drivers were cited with a following-too-closely ticket. "On average we have 34 percent of our traffic crashes from following too close," Capt. Chris DeHart of RCPD told the Seven Hills Rotary Club Tuesday. It's still been problematic to get data because this law just changed in July, he added. Say someone is involved in a traffic crash and they were on their phone, he said. They probably won't admit they were on their phone and distracted unless they feel guilty about it. This makes it difficult to directly attribute the cause of a wreck to someone being on their phone. "We know it is happening, we just can't document it," DeHart said. The 34 percent of "following-too-closely" is not just composed of suspected phone distractions. The actual cause of those wrecks could be from a number of scenarios. However, before this law was passed in July of 2018, the number of wrecks caused by "following too closely" was well over 50 percent, he said. He expects the number to eventually plateau in the 20 percent range. "There is still work to be done," he said. Rome police gave drivers a 60-day grace period, in which they issued warnings to drivers they saw using their phones. From when tickets began to be written until now, Rome police records show officers wrote over 300 citations for phone-related offenses. On a state level, single car crashes are high among drivers between 15-25 years old, DeHart said. Currently there is an amendment to the hands-free law in the Georgia General Assembly which, if passed, would bar drivers under the age of 18 from using a hands-free device in the car. The bill is being sponsored by Rep. Eddie Lumsden, R-Armuchee. Today's artwork is by Donavon Holsonback, a fifth-grader at Model Elementary School.